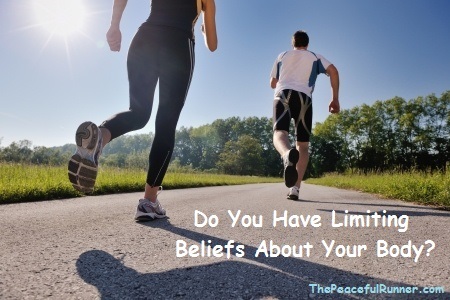 Do you have limiting beliefs about your body? Welcome to our monthly newsletter -- Do You Have Limiting Beliefs About Your Body? We hope you enjoy this issue and it helps you become aware of any beliefs that are holding you back from enjoying what you are truly capable of achieving. Limiting beliefs are beliefs that constrain us from achieving what we would otherwise be capable of accomplishing. They are an incorrect conclusion based on an experience that we have had. For example, we developed a running injury so now we believe we can easily get injured while running. What you believe about your body can have a dramatic effect on how you run and how often you get injured. The human body is an amazing machine and it is capable of achieving great physical feats. If we believe in the true capabilities of our bodies, we would not be subject to false limitations that we put in place. We can teach our body to do whatever we want it to do. It is at our disposal and not the other way around. We are in control. It is only our limiting beliefs that make us think otherwise. What Do You Believe About Your Body? What do you believe about your body's limitations? Write down how you believe it is limited and then reflect on your beliefs. (This belief will be related to the biggest problem that you are now experiencing with running.) Why do you think this is true? Maybe you have been holding back because you believe this to be true. Maybe you believe it to be true because you see evidence to support your belief. For example, maybe you have limiting beliefs about your knees. You believe that you have weak knees and you will always have pain there. You often experience pain in your knees so this evidence helps to confirm your belief. What if you decided to believe that your knees were healthy and strong: "I have strong and healthy knees" and you affirm this every day? Eventually you will begin to see evidence of your new belief. You can make a choice to believe in the true strength of your body. You can choose to believe in your true potential. Do you believe that part of your body is weak or flawed, or that you can only run a certain distance, or that you can only go a certain speed? You can change your thoughts and beliefs to create more positive and desirable outcomes. You are the driver. You are in control. Whatever you desire from your body, it is available to you. Affirmation: "I have strong and healthy feet." I used this affirmation to help me overcome a false belief that I had about my feet. When I first began running in minimalist shoes, I developed top-of-foot pain in both feet at different times. Both injuries resulted in my having to stop running for months at a time. I believed that my feet were weak and I would always be vulnerable to injury there. Then I began to question what I was believing about my feet and I decided that I would no longer allow this false belief to interfere with the health of my body. So I decided to believe that, "I have strong and healthy feet." This is what I now believe and this is what I now see evidence of. My feet are strong and I no longer worry about hurting them. I am very confident that I will never have another problem with my feet and I am still running in minimalist shoes (nearly 4 years). Do you have an area of your body for which you have a false and limiting belief? You can change your thoughts. Make a decision today to change what you believe about your body. You are in control--not your body! Positive affirmations are an effective way to help you change any undesirable beliefs you may have. The 10 Most Powerful Affirmations for Runners can help you eliminate any limiting beliefs you may have about your body. You will become a more confident runner as you begin to truly believe in the real capabilities of your body. For a short time only, the 10 Most Powerful Affirmations for Runners is available for 50% off the regular price! This is a full program which includes 6 audio files and an extensive guide to help you master the program. Make the decision today to believe in your body's true potential! So what about you? What has been holding you back from achieving your true potential while running? We would love to hear from you. Please share your experience in the comments section below. How Do You Deal With Running Pain? As always, keep running, smiling and be happy and peaceful! Back to top of Do You Have Limiting Beliefs About Your Body? If you have enjoyed this ezine and would like to have it delivered to your Inbox monthly, you can subscribe here.